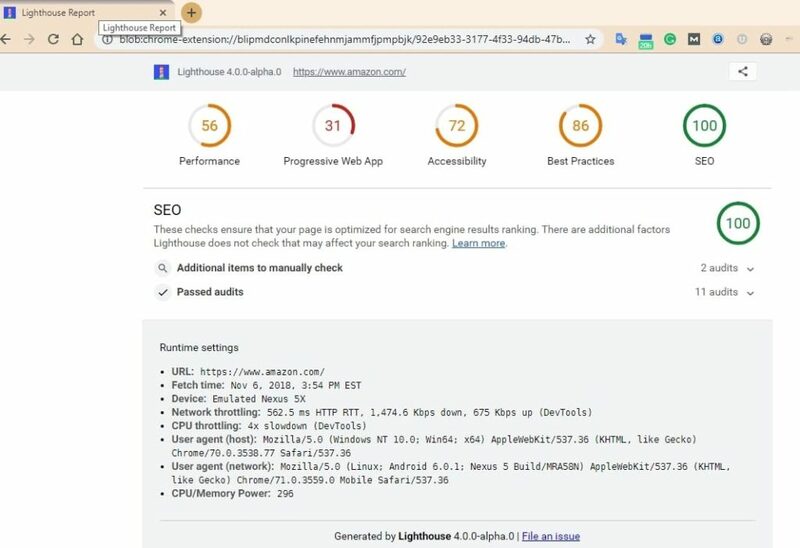 Google recently developed a tool called Lighthouse that helps identify problems with your website by running an audit through Chrome. It’s an effective tool for identifying issues with your site. This article will tell you what it is and how to use it. What is Google Chrome Lighthouse? Lighthouse is an open source, automated tool built into Google Chrome’s Developer Tools. It audits a selected web page to identify errors that affect ranking, and it can be run on both public web pages as well as web pages pending approval within a web hosting interface. When Lighthouse completes an audit, a report is generated outlining areas where your website performs well and areas needing improvement. The tool is free, it can be run as a command line in developer tools or a Chrome Extension. Its default setting is to scan the mobile version of your website. Since Google now uses mobile first indexing, it’s a good idea to start there. To run Lighthouse audits, go here. Once the extension is installed, you can right click on any page and click Inspect, then go to Audits (You need to click the >> tab to get the drop down). How will Lighthouse help your website? Speed is a ranking factor for Google, although there has been some debate as to which metric Google uses to measure it. 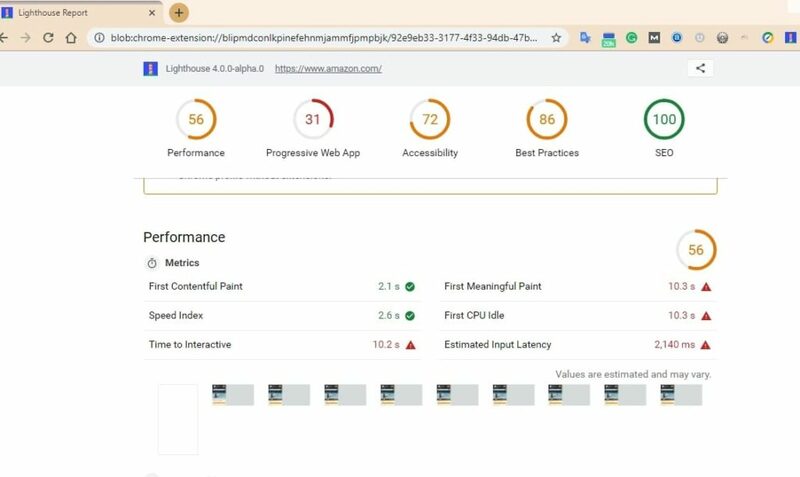 Lighthouse remedies this by and listing the metrics it uses to determine site speed in the performance section of the audit. This information can be used to identify what steps in the loading process are problematic for your site. Once you identify these problem spots you can take the appropriate steps to remedy the issues. An over-sized network payload means a longer loading time, meaning the user accessing your site is using more data.. Reducing the number and size of network requests helps save your users money and create a better user experience. DOM trees are essential to website architecture, but having a DOM tree that is too large can affect page performance factors such as Runtime Performance, Memory Performance, and others. An optimal DOM tree has less than 1500 Nodes, a depth of no more than 32 Nodes, and no more than 60 Child Nodes assigned to a Parent Node. Read more about DOM and SEO. 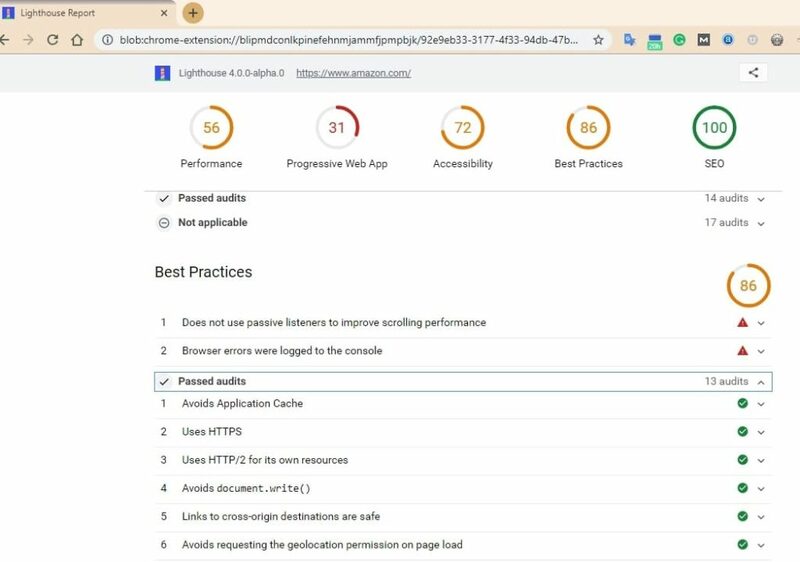 The findings in a Chrome Lighthouse Audit report are split into 5 scored categories: Performance, Progressive Web App, Accessibility, Best Practices, and SEO. The scores range between 0 and 100 and are color-coded with 0-44 being red, 45-74 being yellow, and 75 to 100 being green. A score of 100 indicates that a given attribute of your website is in the 98th percentile, and a score of 50 equates to being in the 75th percentile. A score of 0 is usually a system error, not even the worst sites score that. The Performance Score is compiled by measuring the First Contentful Paint, First Meaningful Paint, Speed Index, First CPU Idle, Time to Interactive, and Estimated Input Latency metrics. The final score displayed is the weighted average of these metrics. A better performance score means your website loads faster and uses less data. 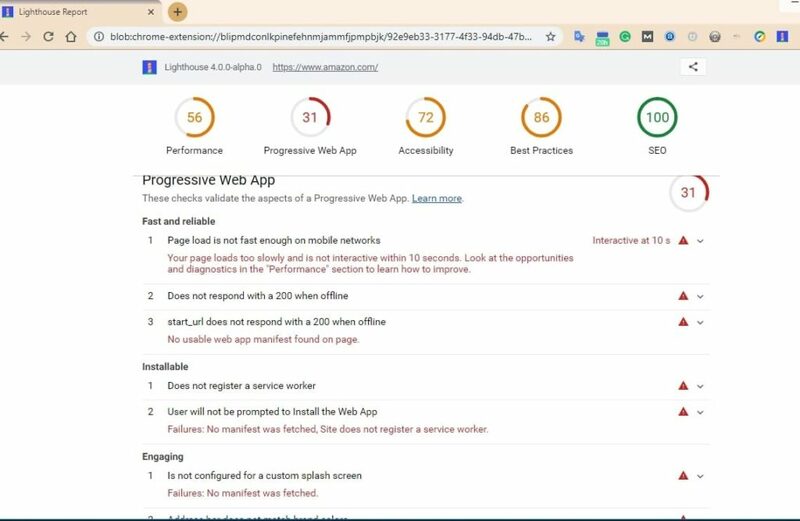 The PWA Score is compiled by measuring elements listed in Google’s Progressive Web App Checklist. This includes key aspects like your website’s responsiveness across devices and if it loads fast on 3G Networks. A better PWA Score means your website is more likely to perform well in mobile browsers. 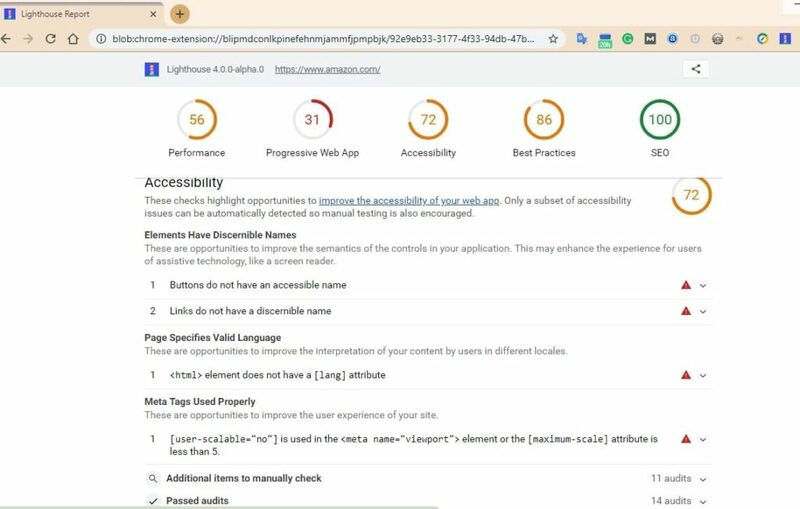 The Accessibility Score measures page elements used by Search Crawlers to index and rank a website. This includes image alt tags, titles and descriptions, and other elements that identify attributes of a web page. The Best Practices Score measures the number of recommended web practices a website follows. Elements it looks for include whether your website connects via HTTPS and whether the page requests geolocation while loading. A good Best Practices Score indicates that a website is secure and user-friendly. The SEO Score is compiled by examining page elements and content elements to see whether they meet SEO Best Practices. SEO helps web pages rank better in search results by using relevant content and page tags. These create a better user experience and also help search engine crawlers properly index and rank web pages. A better SEO score means your website performs well in online search results. Once you have all of this information, the next question will be how you use it. What solutions will address the issues the Google Lighthouse Audit uncovered? Now is the time to develop a strategy for improving your website. This strategy will need to address different considerations depending on the scores for each category. For example, if you are getting a low performance score you may want to consider reducing file requests or minifying scripts. If you are getting a low accessibility score you may need to check your robots.txt for any errors. The best approach is to approach each score individually while trying to remain mindful of how they interact. Now that you have your strategy, you have to determine how often you will check your website’s progress and what tools you will use to do it. These will depend largely on the type of business your website represents and your goals. If your goal is to bring more traffic to your website, you should add Google Analytics tracking code to your site and check back after about 2 weeks to see if there has been any positive change. If you are looking to improve the user experience you can use Hot Jar to track the movement of a user’s mouse. A sales driven business should check their data around the end of each sales cycle. Seasonal businesses should only collect data from around the season your business is active. Now that you have implemented changes and you are looking at the tracking data, you will wonder what to expect. This too depends on your goals and what kinds of corrections you needed to make. For example, corrections to issues like site speed that affect your performance score should show almost immediately. Correcting SEO and ranking issues, however, takes longer. It can take Google anywhere between a single day to a few weeks to notice changes to your website and re-index it, and it can take significantly longer for those changes to affect rankings. So the best question is when to re-test? The answer to this varies. If you want to be sure you are retesting with the current version of Google Lighthouse used to do the original audit, you should test again immediately. This is acceptable if the issue you needed to address was an issue affecting the performance score. If you want to use the newest version of Lighthouse, you should wait 6 weeks for the next Chrome Update. In the end, you may still need to contact a professional SEO or digital marketing firm to help you. Coding isn’t for everybody, and for some trying to understand all of the information in a Lighthouse report is daunting. Google Lighthouse is an effective SEO tool. 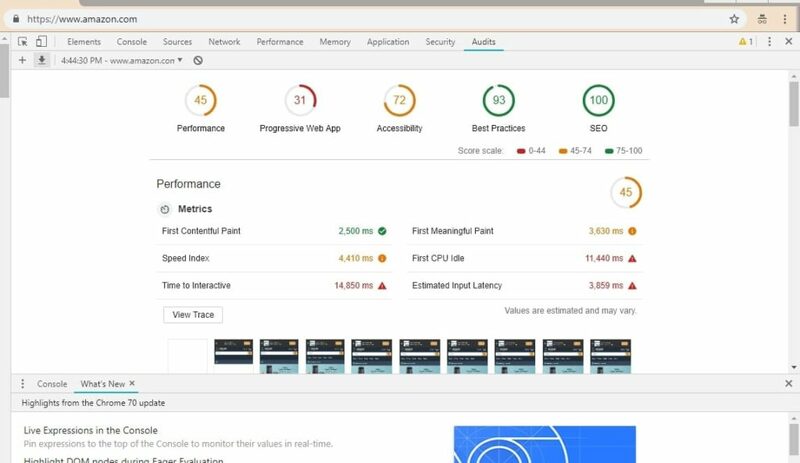 Even if you are ranking well in search, you should still use Lighthouse to ensure your website has the best possible user experience on different devices. For SEOs and Web Engineers especially Lighthouse an essential tool. As it is published by Google, you know the information and recommendation apps are based on the best practices associated with the latest algorithm updates. This takes much of the guesswork out of website optimization. For small businesses, Lighthouse is like your website Urgent Care. If you aren’t sure you have money for an agency, Lighthouse helps you determine if you can correct it yourself.